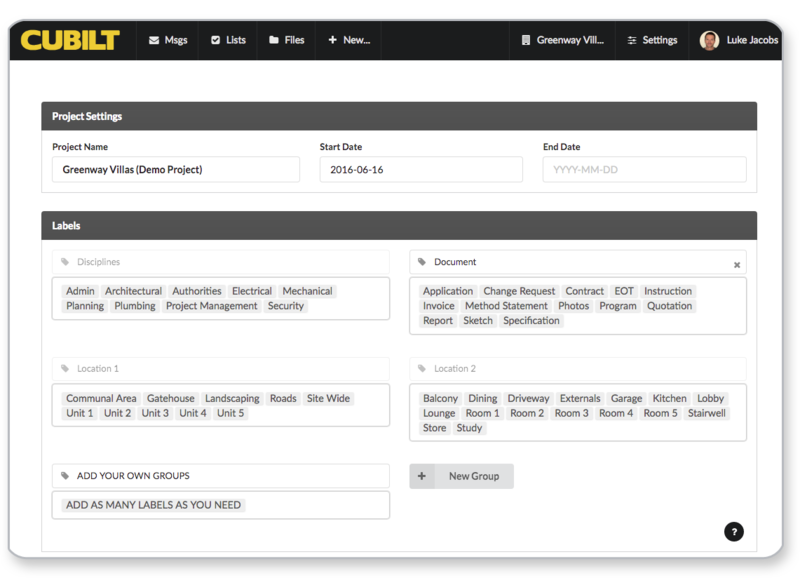 Cloud based collaboration tools for sharing and tracking information across construction projects. Project collaboration has moved online. You should move to Cubilt. It’s not a question of whether to use cloud based project software, the question is… which platform should you use? Even small projects generate mountains of correspondence. Managing this through conventional email can be challenging when your inbox doesn’t tell you if there are open actions related to any particular email. 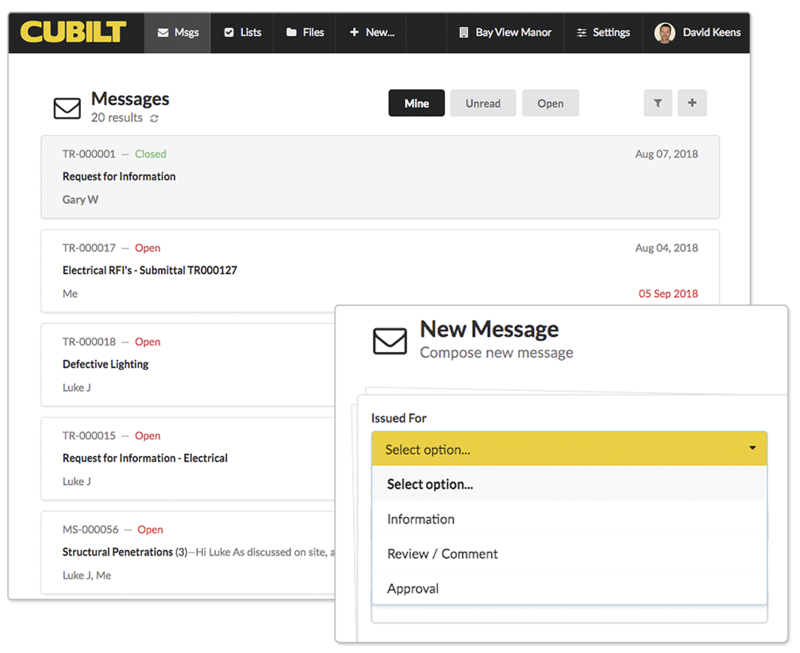 Cubilt uses a task based messaging platform that helps you stay on top of open actions. Turn your inbox into a live action list by assigning actions to outgoing messages. These remain as open actions until you choose to close them. You can easily filter your mailbox by actions open with any particular team member, as well filter by days due, overdue and an infinite combination of search strings. Ever sent an email requesting a clear Yes/No answer, only to receive a long winded or ambiguous response that neither approves nor rejects the request? 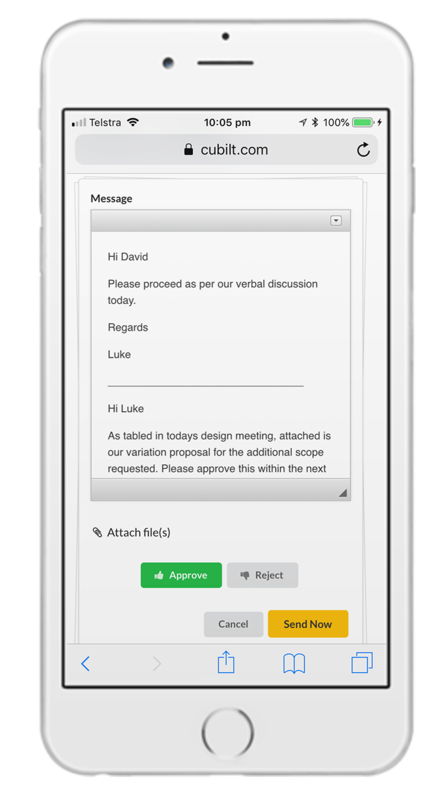 Cubilt puts an end to this with an approvals process that requires an Approve/Reject response in order to close the action. If you're still using spread sheets and email to manage RFIs then you're exposing your project to significant risk. Delays in closing out RFI’s cost the building industry millions of Dollars every year and even when RFI’s are responded to in time, the administration costs can be thousands of Dollars per RFI. Raise multiple RFI’s as part of a single transmittal. Each RFI is treated as an individual item giving you improved visibility of actual number of RFI’s raised, those under review and closed. Attach any files to each separate RFI to ensure you provide enough supporting information with each request. RFI’s are assigned a BIC (ball-in-court) status showing who has current action (initially the recipient). Responding to an RFI shifts the BIC back to the sender for them to review. If they are satisfied with the response they can close the item out. Each RFI tracks the complete conversation through to final acceptance and closure of each RFI. 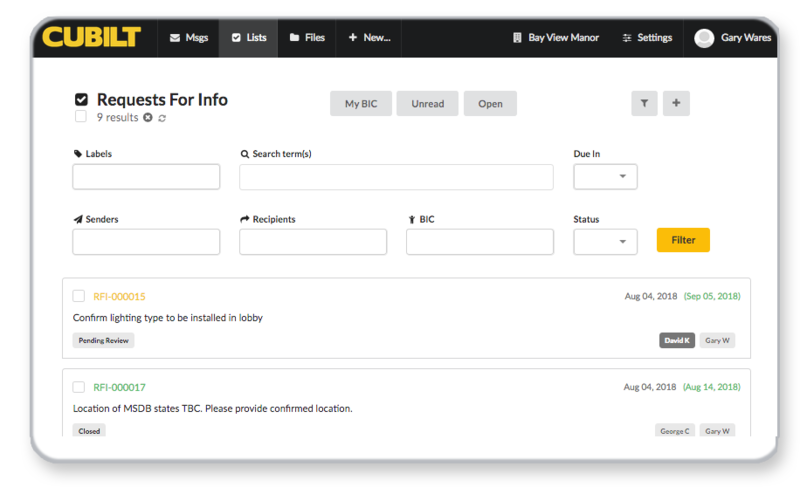 Powerful filtering and search features. That’s what you asked for, that’s what we delivered! 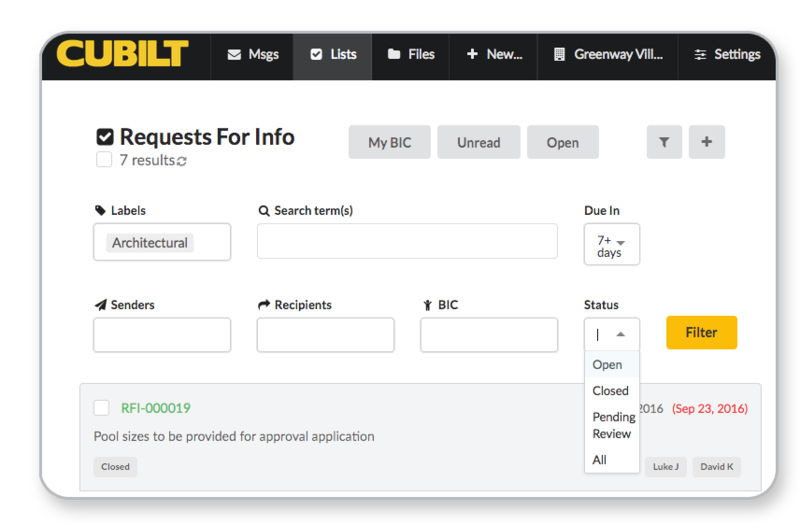 Sort through your RFI index by status, area, discipline, trade package, sender, recipient, due date, BIC or any specific search term you want. No wonder our clients are using our RFI platform for more than just RFI’s. RFI’s are initially only visible to those organisations included on the transmittal. But sometimes you’ll need input from others. No problem! Select only the ones you want to forward and send. The recipient/s will only see and be able to comment on the RFI’s you’ve forwarded. 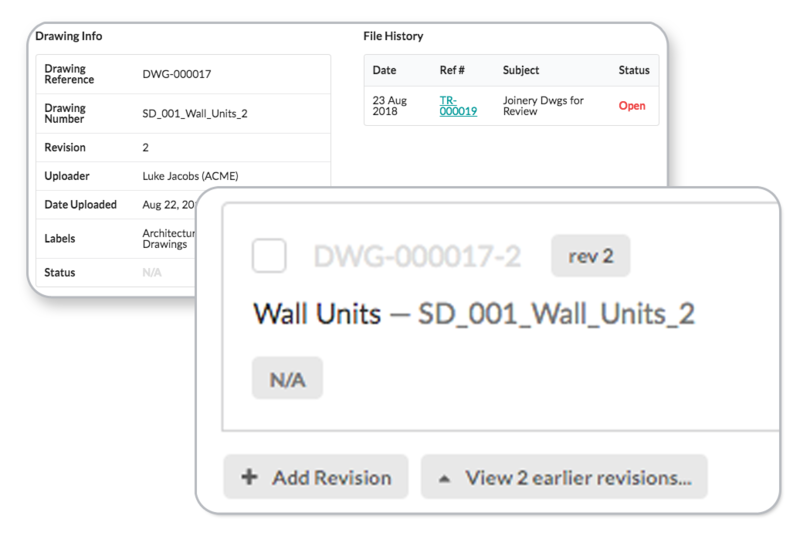 Managing the quality and handover of construction trades requires a robust Punch List/Defects management tool. 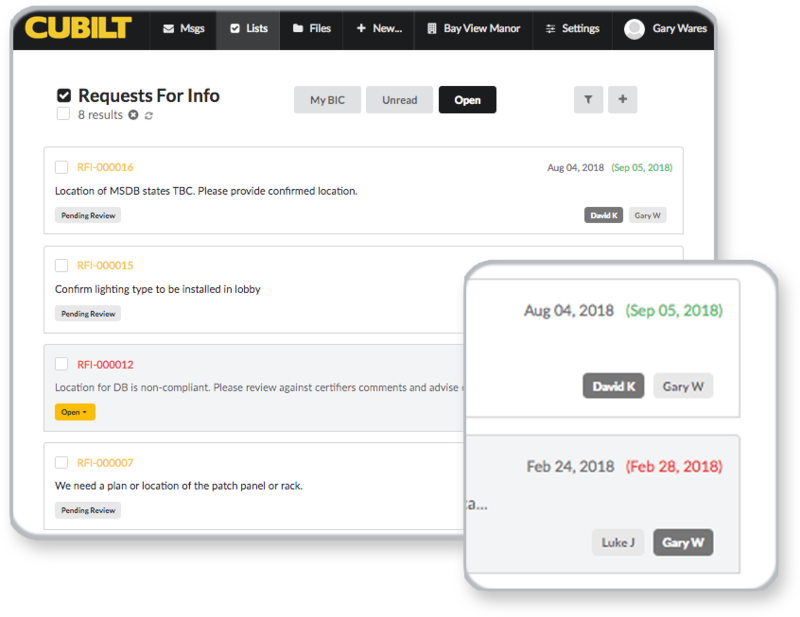 Cubilt’s end-to-end solution is simple and highly effective, allowing you to raise issues in the field, add photos and assign actions to the correct team members. 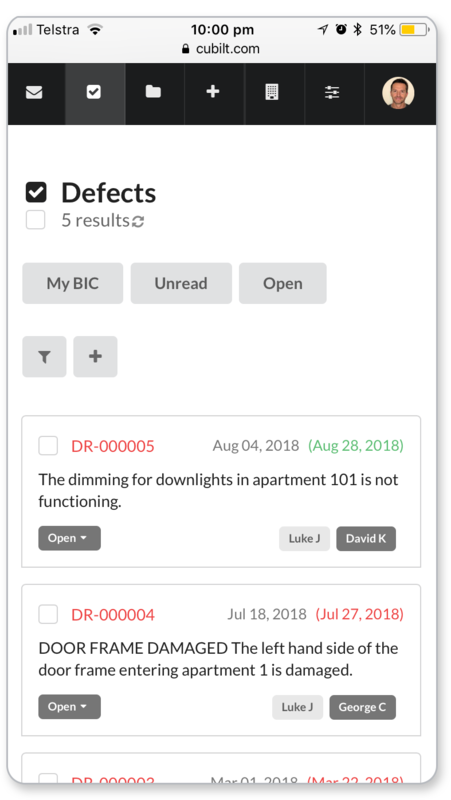 Tracking progress is simplified with status and BIC indicators and being a live database your punch lists are always up to date with latest status. Capture new issues in the field and assign them to the right person for immediate action. 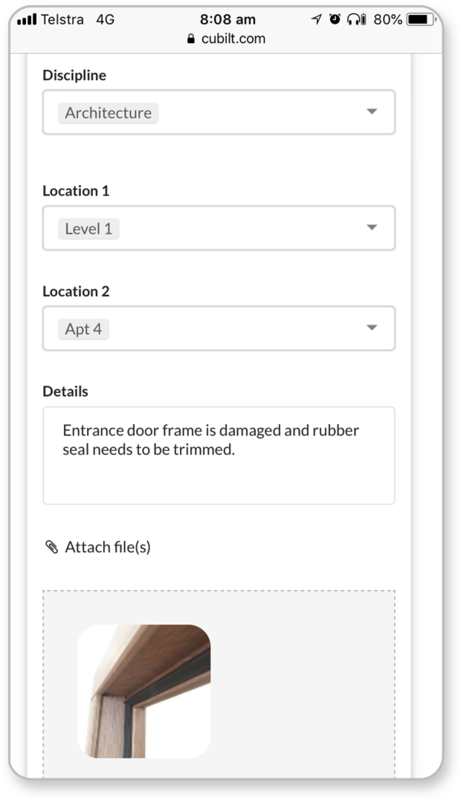 Labelling each item by Location allows your trades to target specific areas for rectification and provides accurate reporting by areas as well as trade. As with RFI’s, Defects are assigned a BIC (ball-in-court) status that changes depending on who needs to take action. Add a photo to show the work as complete and include any text to explain what was done or still needs to be done. Cubilt tracks the full history of each item raised. 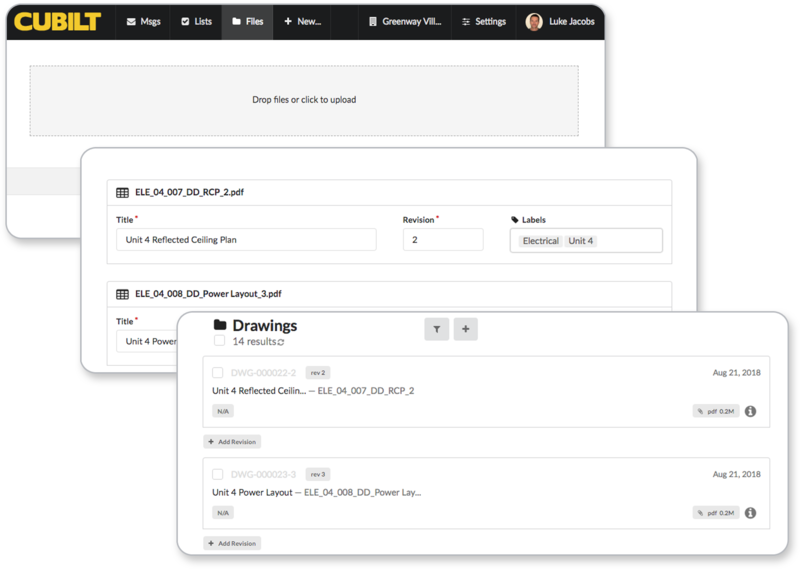 Upload drawings quicker and easier than ever before. Drag and drop or selectfiles from your local drive, server or shared file service to our file upload tool. Label files by Discipline and Location (to make searching for them easier). Revising drawings is even easier! Simply click “Add Revision” and either drag and drop, or navigate to the revised file, then click upload. That’s it!!! 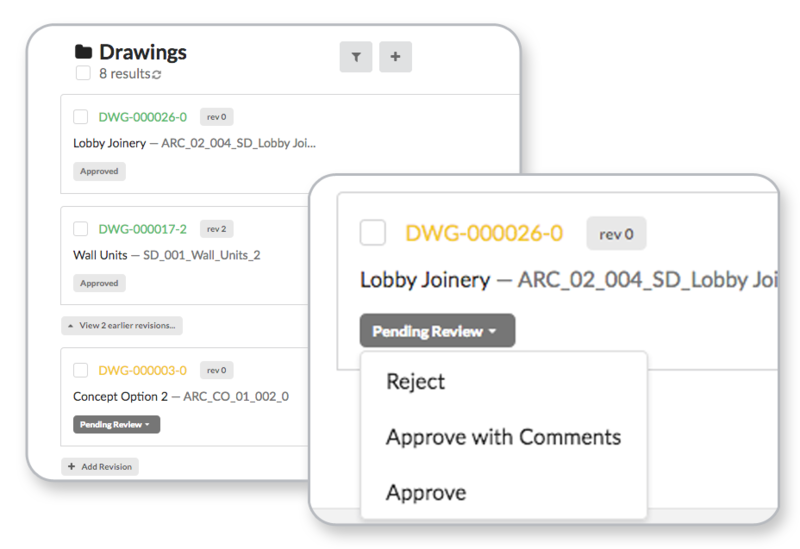 Need an end-to-end drawing approval process that gives your team complete confidence in building to approved plans? See only the latest version of all files with all previous revisions just one click away. View file history to see when a drawing was uploaded, by who, when it was sent, to who and what its status is. A document management system is only as good as it’s ability to easily locate data and with the massive amounts of data construction projects generate it’s essential that the platform you choose has a robust and effective filter and search feature to reduce time looking for critical information. Rigid folder structures used in traditional server based systems mean that a file can only be stored in one location making locating that file incredibly difficult, especially if naming conventions are inconsistent or if a file meets more than one filing criteria and isn’t stored where you might expect it to be. Cubilt uses Labels to save files and correspondence in multiple locations, without duplicating the file, making it significantly easier to find what you’re looking for. So how does this work? Create as many Labels as you need to tag to files and correspondence. Your project administrator can add to these as the project moves through its lifecycle. Spend less time looking for data and more time working with the information you need. Quick Filters at the top of all index pages let you quickly filter key parameters. More powerful filters and search options help you drill down on specific metadata. Our search and filter tools are a game changer. Only paying for what you use means you can setup your project on Cubilt for free, no credit card required. As your team grows and your project becomes data hungry, level up your account to meet your requirements, never paying for features and usage you don’t need. 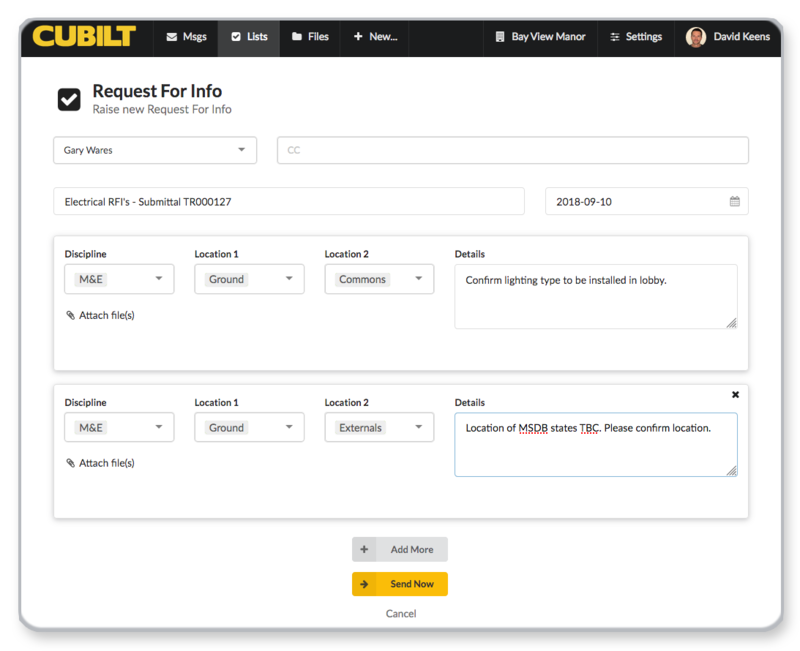 Cubilt is ready to go out the box, so your project can be up and running seconds. 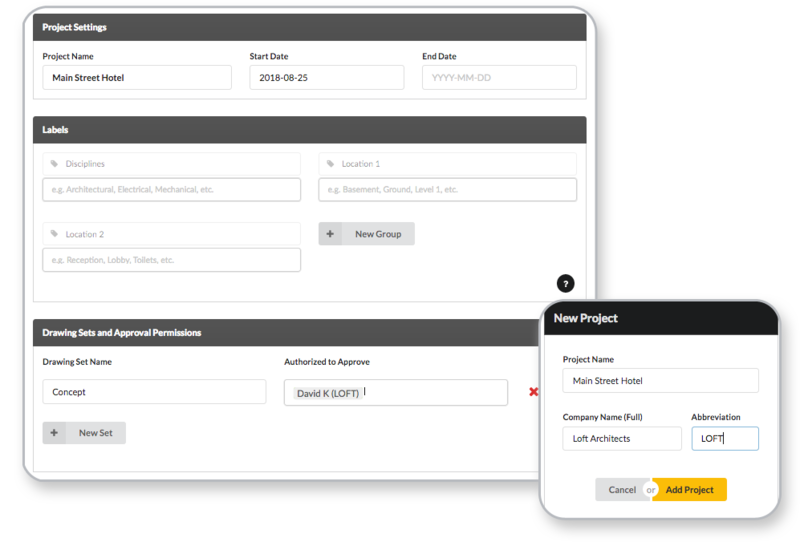 Add team members, define permissions and build your Label directory as you define the parameters of your project. We offer unlimited Users and Projects free on all plans! Project software is as useful as the number of people who use it. — without spending an extra penny! Enter the details of your new collaborator.